​A former Ukrainian MP and active anti-Maidan activist, Oleg Kalashnikov, has been killed in his flat in Kiev. His killing is the latest in a series of odd deaths plaguing former government officials and ex-President Yanukovich’s party members. The 52-year-old was found dead at his residence in Kiev on Wednesday evening. His death was “caused by a gunshot,” the Interior Ministry said in a statement announcing a police inquiry. Ukraine’s criminal investigation chief Vasily Paskal, took the investigation under personal control and promised to share motives and the preliminary results of the probe with reporters as soon as they become available. The investigation is focused on five possible motives for the crime, according to Interior Minister’s senior adviser, Anton Gerashchenko. So far the investigation considers the primary possible motive behind the killing to be Kalashnikov’s “political activity” linked with his “participation in the organization and financing” of counter-revolutionary events in Ukraine. Gerashchenko emphasized that Kalashnikov “had knowledge” of the anti-Maidan movement that resisted the coup last year and continues to challenge new authorities in Kiev. “Without any doubt the deceased knew a lot about who and in what way financed anti-Maidan, which cost Yanukovich and his camarilla several million hryvnias per day. He takes these secrets with him to the grave,” Gerashchenko said, also listing some other leads on his Facebook page. Business debts, personal enmity, burglary attempt and“other versions of murder”are listed among other possible motives. Ukrainian media reported that before the murder Kalashnikov received threats of physical violence for his political views, in particular for his drive to defend Ukrainians’ right to widely celebrate the 70th anniversary of WWII victory. In a letter addressed to his friend before the murder, Kalashnikov allegedly wrote that an “open genocide on dissent, death threats and constant dirty insults” have become the “norm” following his open call to honor the memory of heroes and victims of the Great Patriotic War. “A series of bizarre suicides of ex-regionals [Members of the Party of Regions], and now the murder of Kalashnikov, raises questions to law enforcement authorities. 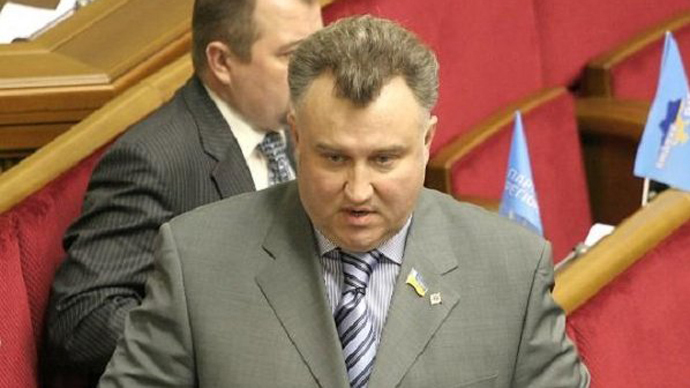 I hope that Ukrainian society will get the answers,” Bereza said. Meanwhile, Oleg Tsarev, parliamentary speaker of the self-proclaimed Novorossiya, agreed that Kalashnikov’s murder is the latest link in a chain of mysterious deaths of former supporters of the Party of Regions. The murder is meant as a warning for all those who dare to oppose Kiev government, which can do anything against the opponents, Tsarev believes. In the past few months, at least eight former Ukrainian government officials died mysterious deaths, with most treated as suicides.